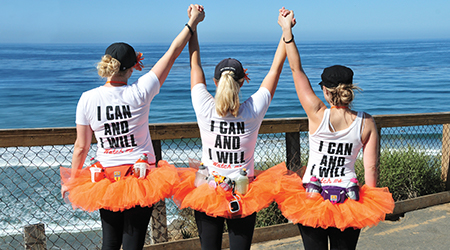 Challenge Walk MS is an endurance event that will move you beyond your limits. It is an experience you'll never forget, shared with new friends and old. 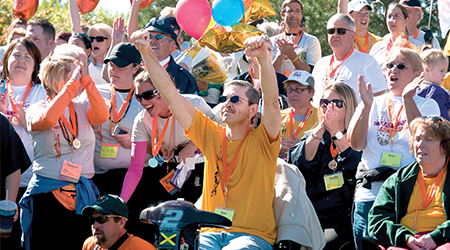 Challenge Walk MS is an endurance walking experience that tests your strength and spirit. Year after year, teams push their physical and mental limits to get closer to a world free of MS. And with each step and dollar you raise, you won't be alone. Because at Challenge Walk MS, we're all in this together. From group training walks to volunteers who hand out ice-cold popsicles when you need them most, we all rely on and appreciate one other – savoring the joy, the triumphs and the connections on our journey together. Once you cross the finish line, you'll have feelings of accomplishment and fulfillment that you worked so hard to achieve. No one can fully describe what it's like to participate in Challenge Walk MS – it's something you must experience for yourself. Challenge Walk MS is a multi-day, fully-supported endurance walking event that dares us to move beyond our limits, both as individuals and as a group. The event has raised over $78 million to stop MS in its tracks, restore what's been lost, and end MS forever. Each Challenge Walk ranges from two to three days and routes vary from 30 to 50 miles. No matter where you participate, every Challenge Walk promises extraordinary support and an unforgettable experience. You can register to walk as an individual, but there's nothing like sharing the experience by starting or joining a team. Each Challenge Walk has a fundraising minimum and pushes the limits of what's possible. So, find a walk near you or go somewhere new!